With the passage of AB-2923, BART has new zoning powers to develop housing around it stations. So how is that process going…? 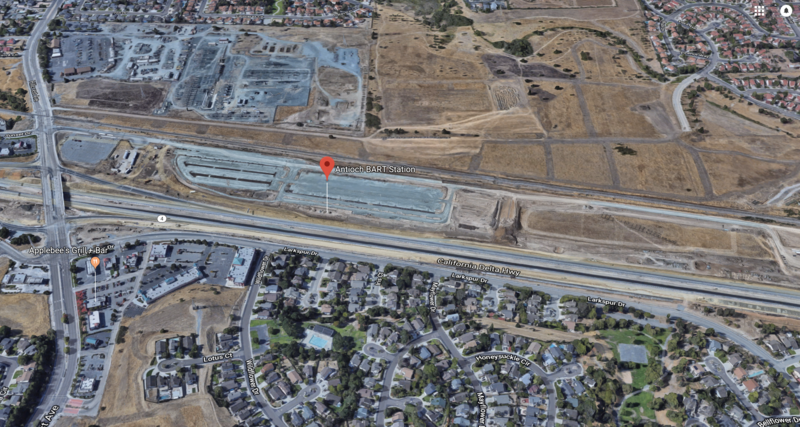 With full funding identified, BART is moving ahead with plans to nearly double the amount of parking at the Antioch Station. Antioch Station currently has 1006 parking stalls. Another 800-plus spaces will be added under this plan. Approval by the BART Board is required with the plan expected to go before Directors in late 2018 or early 2019. Construction would begin in fall of 2019 with the new lot opening in fall of 2020. BART directors representing the eastern suburbs are just not interested in doing transit-oriented development. This is the problem with AB-2923, as it gives BART zoning power that it is generally not interested in using. Canada’s auditor general has previously cited a lack of transparency over the bailouts. “We found it impossible to gain a complete picture of the assistance provided, the difference the assistance made to the viability of the companies, and the amounts recovered and lost,” Michael Ferguson said in his fall 2014 report. At the time of the 2009 auto-sector bailouts in Canada and the United States, Chrysler was split in two: an “Old Chrysler” that went into bankruptcy and a “New Chrysler” that became viable and remains in operation today. Now called Fiat Chrysler, the international firm reported net profits of $4.3 billion US for 2017. It will be interesting to see whether Chrysler continues operating the Canadian plants if Trump goes ahead with tariffs. Perhaps this is just a typo, as there is nothing (that I can find) in the administrative record about banning human-powered bikeshare from the bike path. But it is interesting to note that there are private bike rental firms along the path which benefit enormously from this rule. Allen said today was an opportunity to teach students about what it means to be a peaceful protestor. “Our students today are going to get a lesson on Rosa Parks,” he said. All 114 seats in the council chamber were filled, and others listened outside via speakers in the plaza. Councilwomen Cynthia Chase, Martine Watkins and Richelle Noroyan and Mayor David Terrazas voted yes with Chase requesting an “indestructible” public bathroom open 24/7 as part of the project. “We’re talking about $75,000 per (parking) space,” said Rick Longinotti of the Campaign for Sustainable Transportation. What does it say about a society that prioritizes car storage over book storage at its library?